Lot: South 50 feet of lots 1, 2, 3, Account #3570-388-010-001-01. Condition: Good – Fair; stucco shows some deteriorating at parapet. Description: 2-story; masonry with stucco facade; rectangular plan, 3-bay facade, central entry; flat roof, pedimented parapet with paired castellation at each corner; ornamentation at second floor are blind balconies with tile shed roof, wrought iron railing, spiral columns on brackets and blind arched windows, inset signage panel; first floor has altered aluminum frame display windows with inset double entry doors, suspended boxed aluminum canopy resting upon paired spiral Tuscan columns; transom above is closed over with stucco, some diamond-shaped tile work front and south side at alley; south wall of building has brick pilasters with multipaned ptd [painted] steel windows between at the second floor, diagonal oak flooring, large square pressed metal ceiling. 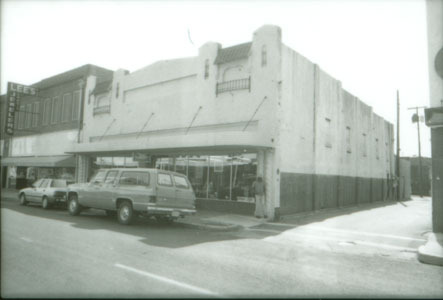 Significance: Listed as the Palace News Stand, Palace Confectionery, and Palace Theatre in the 1928 directory; by 1937 it was Mize Brothers Department Store (from Nacogdoches) and The Hobbs Shop. Good example of Spanish Colonial Revival style. The theatre interiors of the building were not long lived as two other theatres, the Pines next door and another on Frank St. were in competition. Very early in its history the structure was converted to a department store and the majority of the interior spaces from the theatre were necessarily removed.